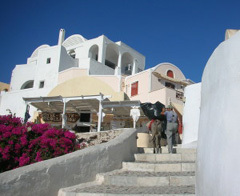 Greece……the cradle of democracy, mathematics, logic and home to amazing architecture set in a fairy tale landscape! Already in ancient times people were in awe of this region and it still fascinates everybody who visits this magic place. Thousands of islands dot the blue sea and there are endless possibilities to find exactly what you are looking for. Even if you were chartering every year in Greece visiting new and beautiful islands every year for the rest of your life, you would never get to see it all, but let us focus on some of the highlights. East of the mainland you find the Ionic Islands, which are not that well know and you can still find some places where nothing much has changed over the years and where the donkey is till important for transportation. Corfu is probably the best known and from there you can cruise all the way down to the ancient town of Messalonhgi by the entrance to the Golf of Corinth. From here you can proceed through the Corinth Canal which is 6 km (4 miles) long, but only 70’ wide so it is not used much commercially, however it is a great way to get to the Aegean Sea and the famous Cyclades Islands. Places like Mykonos, Santorini, Paros and Naxos are well known by now, but have you ever heard about Amorgos, Kimolos or Serifos? Some of these places can only be reached by ferry twice a week, but chartering a crewed yacht you can go anywhere you want and when! The Sporades Islands to the north are mostly un-know to sailors as well as tourists in general with the exceptions of Lemnos and Lesbos, so there are many places to explore. 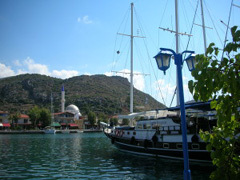 Close to the Turkish mainland are the Dodecanese islands. These islands lie like pearls on a string from Samos to Rhodes with countless bays, beaches dotted by picturesque villages. The crew knows the area and they can take you to enchanting places. After the relations have normalized between Greece and Turkey, it is now also possible to combine you Greek yacht charter with a visit to this interesting country. A big part of Ancient Greece was actually situated in today’s Turkey and here you will also find the remains of former famous cities like Ephesus where the amazing amphitheater is still being used. 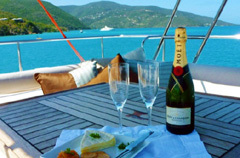 Please CONTACT US if you are considering a Greek yacht charter.